A somewhat complex MLM with an emphasis on nutrition, diet and personal care. Consultants for USANA don’t have to buy products in order to sell them, which is certainly an advantage for the company. However, this is coupled with expensive products and a compensation plan that is both challenging and complicated. This means that actually making money with the company will be difficult for most people. USANA is available in more than 50 different products across the categories of Nutritional, Diet & Energy, and Personal Care. For the most part, there is nothing particularly special about their products. For example, their meal replacement shakes are pretty much what you would expect (aside from a hefty price tag). Even the ingredients list for the product is pretty similar to what you would find for similar products online or in stores. Whey protein shake? Wow! OMG! So original! In some cases, the products use a proprietary mix, although they offer little evidence about whether this is effective or not. Thinking of a snappy name like “Nutrimeal” and placing a TM (trademark) sign above it doesn't make it healthy or effective. I’ll get back to this issue in a little bit. 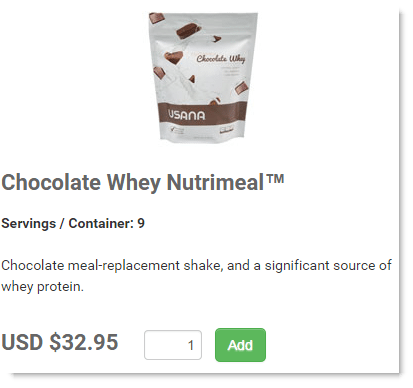 USANA’s products are very common on Amazon and on eBay – although it is mostly the protein shakes and the supplements that you find. They seem to be selling for a bit less than the company’s site offers, which might be a problem for reps of the company. In general, the products seem to receive mostly positive reviews, but that doesn’t mean much for this type of product. When it comes to supplements, the physical effect you feel is often minimal unless you were actually deficient in something that the supplement was for. However, people tend to convince themselves that they feel a change. For example, your energy levels change every day from a range of factors. If you took a supplement that claimed to boost your energy, you would associate any energy increase with the supplement. Many people end up paying more attention to the boosts in energy, and less to any decreases. In a similar way, the shakes receive good reviews, but most of them would apply to any protein shake out there. With this type of shake, you are drinking it instead of having a meal. So yes, you probably would lose weight. So, the products might get good reviews, but take this with a grain of salt. It doesn’t necessarily mean that the products are good – and it certainly doesn’t mean that they are better than what is out there. The key emphasis of USANA is health. In fact, the full name of the company is even USANA Health Sciences, which certainly implies that the company takes health seriously and that it does its research. More than one MLM company implies that their claims are science based, but the vast majority of the time, these types of MLM use corporate tactics to buy results they want. The company is involved in a number of research papers, but this doesn’t actually suggest their products do what they say. Most of their research focuses on general nutrients and approaches for improving health like olive oil, vitamin C, vitamin E and vitamin A – which can be found in a range of different products. And I haven't even talked about the potential for bias in in-house research. Let me give you a hint: There's a lot. There is nothing indicating that USANA’s own products are any better than nutritional supplements or other similar products out on the market. Yet, USANA’s products tend to be expensive. 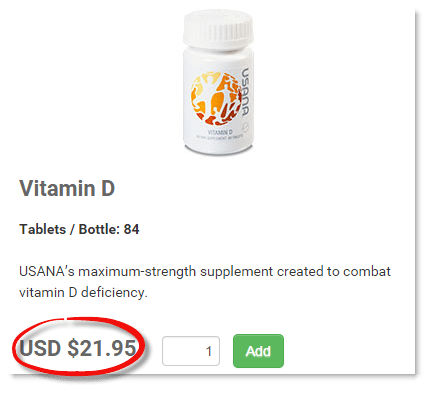 For example: USANA sells an 84 tablet bottle of vitamin D supplements at $21.95. The product is promoted as being ‘maximum strength’, yet it contains 2,000 IU of vitamin D. This is relatively low and you can find products with 5,000 IU in the store or online for a fraction of the price. USANA never even tries to prove that its form of vitamin D is better. Instead, any research on vitamin D they do just proves that it is important (which it is). 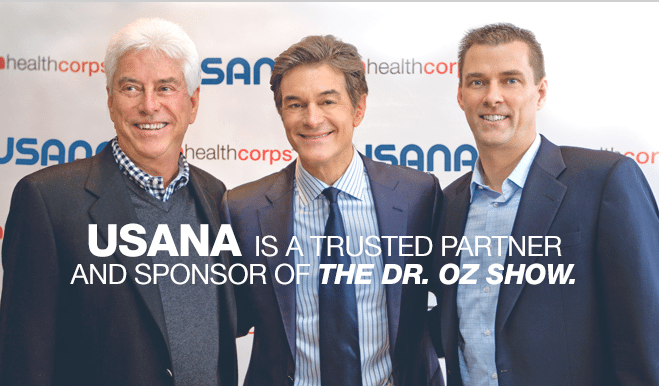 Additionally, USANA has a strong association with the Dr. Oz Show as well, which has concerning implications for USANA science. Ick. This would stop me trusting this company immediately. Dr. Oz might have a cult-like following, but Dr. Oz has been before a senate subcommittee for bogus health claims – with a senator saying that he ‘plays a role in perpetuating scams’. With the toxic nature of Dr. Oz’s reputation right now, I wouldn’t want to promote any company even remotely associated with him. 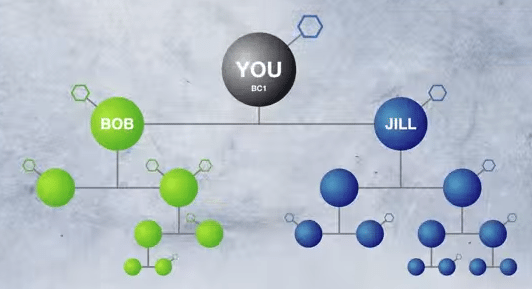 USANA’s opportunity is focused on the idea of earning money while promoting the products of the company. The concept of the business is that you recruit people to form the left arm and the right arm of your business. You are then involved with helping the people you recruit to recruit others, and so forth. The site promotes that you earn a 20% commission bonus on sales. This breaks down as a matching bonus of 10% on the left side of the business and 10% on the right. Because of this, you have to recruit two different people who are successful (and continue to be successful) to make any headway in the business. A major issue of compensation plans for MLMs is that they get complicated fast. The approach often makes it seem like it is easier to earn money than it actually is. It also makes it hard for people to work out how to maximize profit. On top of all of this is the added bonuses for people who meet certain goals. These are promoted as additional ways of earning money, but they also increase the challenge and the complexity of being successful. One tricky thing with this company is that you start out with a limitation on how many people you can recruit. Specifically, you can recruit a total of four people and then you are supposed to help them to build the people they recruit. In general, the setup is such that you are helping people you recruited to recruit others, rather than recruiting additional people yourself. This is a bit unusual and potentially challenging. Making money is also based on getting the two sides of your business to match, and you are actually limited by the success of your smallest side. Recruiting others and making sales in this type of company can be challenging. Finding four other people who can do this and are as dedicated as you, is even more so. Personally, I'd rather rely on my own hard work than counting on others to be as motivated an enthusiastic as myself. Plus, you really want these people to be promoting to different markets, otherwise they will just be in direct competition with each other. With multiple ways of earning money and downlines, the opportunity might sound like a great way of earning money. However, as tends to be the case with MLM, theory and practice are often very different from each other. In total, less than 15% of all people who join the company are even considered active (which involves earning at least one check per month). The vast majority of these come in at the ‘builder’ level or lower, which is an average of $169 per week. Now, this might still seem like a good number, but this is the average – meaning that a lot of people are earning less. In fact, the annual low for the builder tier calculates out to around $44 a week, with the other tiers lower than that. This means that your chance of earning a decent amount of money with the company is unbelievably low. Additionally, these statistics don’t take into account how much work is actually involved in earning this money. This isn’t a passive business and you do have to actively sell and promote the company no matter how successful you are. To even be able to earn commissions, you have to have buy a certain amount of product every month. This is either 100 points or 200 points depending on the size of your business. While we’re on the topic, I want to briefly mention the points system. 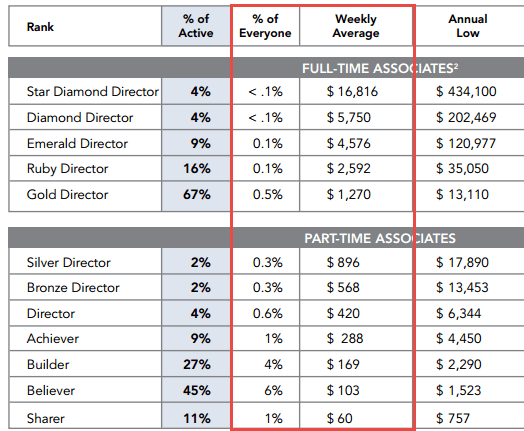 USANA tends to talk about product volume and profit largely in terms of points. In theory, this makes the entire discussion simpler. However, it also makes it harder to work out exactly how much money is being talked about. A skeptical person might say that this is done on purpose, to make people forget how much they are spending for this “opportunity”. The company does have one key advantage over many other MLMs. This is the fact that customers order through the company, rather than through the consultants. This means that consultants don’t actually have to buy stock then sell it to customers. Instead, they refer customers to a specific portal on the website for the company and the customers order through that. This is one part of the company that works well. It means that you don’t have to worry about inventory and there is less risk overall. It is nice that customers can buy directly from USANA and that consultants don’t have to keep stock on hand. However, even with this, the company still has an excessively complicated and challenging commission plan, as well as products that aren’t really that appealing. Health and nutrition is a big field, and USANA is just one of the many companies selling in it. If you are passionate about this field, then good for you, but why promote expensive products that aren’t really that great? An alternative approach for making money is called affiliate marketing. It is easier to get started with affiliate marketing, you get to pick what you promote and there are a whole lot less restrictions. In fact, with affiliate marketing, you are the one in control of your business, not some large corporation. You simply put up a website on a topic you choose, promote products you like, and drive traffic to your pages from search engines or social media. It takes time to build, for sure, but it can help you gain passive income, and you can even “flip” the business, for 30x earnings later on. That means a website earning just $1,000 USD per month could fetch a $30,000 USD price on the website sales market! Why not just create some good products and have people sell them as affiliates? This overly complicated system is designed to work against you, not for you.